Coalition for Healthy Ports & Newark Mayor Ras Baraka Tell Port Authority: "Employ Us - Don't Poison Us"
Act now to end the deadly diesel poisoning of tens of thousands of Newark's residents by the trucks serving the nation's second largest port was the strongly worded message delivered this morning by Mayor Ras Baraka and Coalition for Healthy Ports (CHP) Chair, Amy Goldsmith to the Port Authority of NY&NJ (PANYNJ or Port Authority). On the steps of Newark City Hall, under the slogan "Employ Us, Don't Poison Us," the Mayor and Goldsmith were joined by Municipal Council President, Mildred C. Crump, Kim Gaddy a 4th Generation South Ward resident and Clean Water Action’s Environmental Justice Organizer, Lito Miranda East Ward resident of the Ironbound Community Corporation, Bienvenido Paulino, truck driver at Eastern Drayage and representative of the International Brotherhood of Teamsters, as well as Zach McCue of US Senator Cory Booker’s office. CHP has been pressing the Port Authority to reinstate its scheduled ban on trucks with engines older than 2007 (similar to a ban at the nation's largest port complex in Los Angeles and Long Beach, California). In January 2016, the PANYNJ rescinded its announced plan to ban older trucks from entering the port starting January 1, 2017 on the grounds that it couldn't afford to do it and would cause the port to close. CHP and its allies have noted that NYNJ shippers and trucking companies would conform to the new rule as they did 10 years ago on the West Coast when it was put in place and it was understood that the authorities would not back down. Lower and near-zero emission truck technologies have been proven effective, are readily available and in use wherever required by port governing bodies. There is no excuse for the PANYNJ’s reneging on its prior commitments to significantly clean the air and improve public health conditions in the NYNJ port region. The price of continuing to allow the diesel truck pollution of Newark's neighborhoods is the extraordinarily high incidence of childhood asthma and premature deaths of adults from lung cancer, heart disease, stroke and neurological disorders, as documented by medical doctors and public health researchers all over the U.S. including Robert Laumbach, MD at Rutgers University, and Andrea Hricko, Professor of Preventive Medicine at the University of Southern California Keck School of Medicine, advisors to CHP. The PANYNJ is enabling irresponsible shippers and trucking companies to cause hundreds of millions of dollars in medical expenses and lost days at work in port communities, costs that are unfairly shifted onto the backs of Newark residents. Mayor Baraka understands the link between good jobs and clean air. He joins CHP in calling on the Port Authority of NY&NJ, shippers and terminal operators to hire more Newark residents for good port jobs, to change the conditions for low wage port drivers and to honor CHP's demands for prompt action to end diesel pollution at the Port. “The time is long overdue for the Port Authority to adopt rules that require immediate and substantial reductions in the deadly diesel emissions from the trucks serving the Port of Newark. These trucks, due to no fault of the low-wage drivers, continue to poison tens of thousands of our residents. This is especially outrageous because lower emission and near-zero emission trucks are now available and in use where other port authorities have required it,” said Amy Goldsmith, Chair of the Coalition for Healthy Ports. "Hire us, don't poison us. 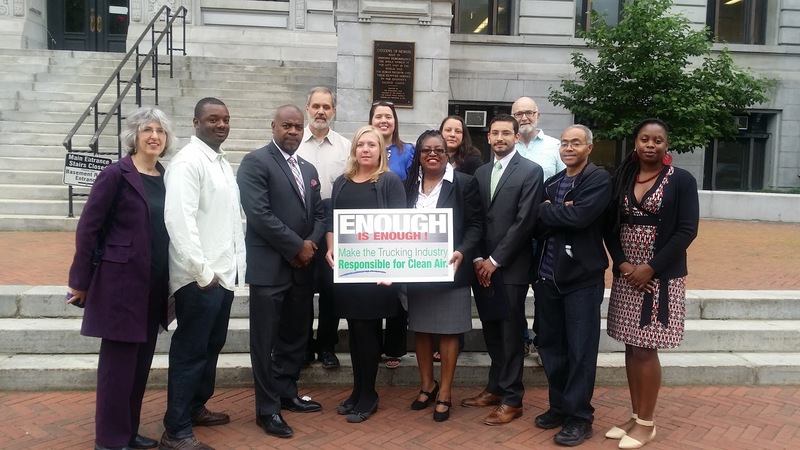 The Port Authority has the power to end the diesel-truck poisoning of port communities like Newark. It can require shippers to use lower and near-zero emission truck engines, as some other ports have done. Yet the Port Authority has continued to allow shippers to profit at the expense of our health and our lives. This must end here and now,” said Newark Mayor Ras Baraka. "Hire us, don't poison us. The Port Authority has the power to end the diesel-truck poisoning of port communities like Newark. It can require shippers to use lower and near-zero emission truck engines, as some other ports have done. Yet the Port Authority has continued to allow shippers to profit at the expense of our health and our lives. This must end here and now," said Newark Mayor Ras Baraka. "The time is long overdue for the Port Authority to be a good neighbor to the residents of Newark, to adopt rules that require immediate and substantial reductions in the deadly diesel emissions from the trucks serving the Port of Newark. These trucks, due to no fault of the low-wage drivers, continue to poison tens of thousands of our residents. This is especially outrageous because lower emission and near-zero emission trucks are now available and in use where other port authorities have required it,” said Amy Goldsmith, Chair of the Coalition for Healthy Ports and State Director of Clean Water Action. "As a resident of the South Ward and mother of three children with asthma, it's time for the City of Newark to create a community benefits agreement from the Port of NY&NJ that provides mitigation funds to address the health injustices our families are experiencing due to the diesel pollution from the Newark Port,” stated Kim Gaddy, 4th Generation South Ward (Newark) Resident and Clean Water Action's Environmental Justice Organizer. "Everyday my life is impacted by the diesel pollution from the ships, rail, trucks and equipment and it's everywhere and I can't escape. It’s time to clean up diesel pollution, so we can work and breathe clean air now!” concluded Regina Townes, Newark resident and Longshoreman at the Port.